Leopard Mountain Safari Lodge in Zululand Rhino Reserve, KwaZulu-Natal is a peaceful and tranquil retreat with friendly hospitality and Big Five game viewing. Leopard Mountain Safari Lodge (formerly known as Leopard Mountain Game Lodge) features a very comfortable dining room, bar, lounge and deck area. The lodge also has team building and conferencing facilities and a range of activities. 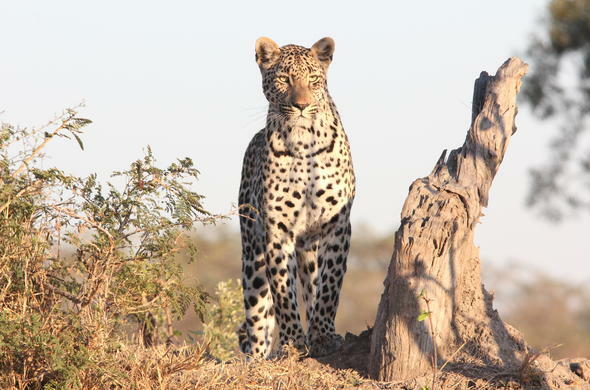 Leopard Mountain Safari Lodge is the ideal getaway, where guests will enjoy a fascinating experience in the wild. This KwaZulu-Natal safari lodge is located high up in the wild secluded hills of the 23 000ha Zululand Rhino Reserve. Relax and enjoy the fantastic views of the unspoiled beauty around you, from the river meandering below to the distant Lebombo Mountains. This KwaZulu-Natal Safari Lodge boasts a rich variety of birds and an abundance of wildlife including Rhino, Cheetah and Leopard. Go on game drives and bush walks and see the animals interact with their young. Join the midday waterhole lookout activity and watch an array of animals come down to drink from the unique waterhole setting. Interact with elephants, a must-have experience in the African wilderness. You will be welcomed by 2 enormous African Elephants - Rambo and Rachael - on and educational about the anatomy and behavior of the African Elephant, additionally the Amazing story of Rambo and Rachael will be told to you.